Peach trees hate water logged soils, but will grow just about anywhere else. They will die in boggy soils. I always find them very hardy, and as the blackboy peach is a fairly late variety, I don't think frost or cold will be a problem. They handle the dry heat well also. They can be a pain to prune as they only fruit on second year wood, so the fruit gets further and further away from the trunk. Summer pruning after they have fruited is best, if you prune in winter they will grow with a vengeance. I've had no luck wherever I've asked about getting one this year. I did however find a local nursery who whilst there checked with one of their 'bare root' suppliers and if I place an order next Jan I can be sure of getting one mid year next year. They sound an appealing choice and as a chef and keen home cook gardener one I'm keen to try. Last edited by Oaklands on Mon Aug 31, 2015 3:22 pm, edited 1 time in total. me either Oaklands. i will check in with my local nurseries if they get any in and when i can order. goodluck, with the ones planted for this season guys! Well today quite by chance I got lucky. I had to drive down to outer Sydney to pick up and bring home 3 stud cows that came up yesterday from a stud dispersal in Vic. On the way home on the off chance I called in to Webers Nursery at Mt Boyce to look at other plants/shrubs/ trees etc and asked if they might have a Black Boy peach. Off we went to look and YES, they had 4, now they only have 2. They are bare rooted trees recently potted up and are about 2 mtrs tall, $39 ea. Last edited by Oaklands on Sat Sep 05, 2015 2:56 pm, edited 1 time in total. well done oaklands, just in time for spring Mine were extremely tall also, so pruned them fairly hard to make it easier on the roots. I'm thinking the same Andy to give them a better chance of establishing properly. Going to try my hand at other propagation methods with the pruning's. I pruned mine hard and passed the prunings onto some friends for grafting. Also tied down the branches as apparently they grow quite tall. Mine was already pruned hard to about 30cm branches, probably was done to post it, as came in a long 30cm square box. When planted it is about 1.2 metres high. Now has some flower buds starting to get ready to open. Is it best to remove first fruit whilst tree is establishing. Ours is flowering. You probably should, Mycoola but we never do - too keen to try the fruit! it hasn't seemed to harm the tree or future crops. 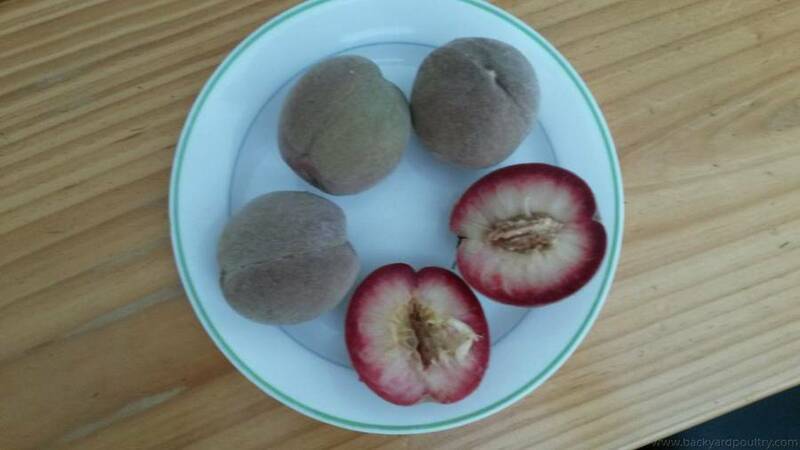 Peaches are generally pretty vigorous, so even for a small tree, carrying a couple of fruit should be Ok.
Well here we are a few months later and the tree I bought has fruited! They look an unappetising sort of red/brown colour on the outside but inside they are red at the skin fading to cream in the centre. The flavour is a light peach flavour, sweet and very nice. Certainly unusual looking! Slightly blurry image, sorry! Ours had 8 on it I think, but we netted it or the birds would have had the lot here too! Do you wash the fur off before cutting & eating? I find peach fur causes my lips to sting if I don't wash the fruit first. Maybe it's from sprays or something....... although just thinking out loud, I had the same problem when I ate my own peaches which were not sprayed.